My Dear, Sweet Maw Maw. Just over a year ago, I introduced you to my grandmother, Maw Maw. We received a call from my mother last night letting us know that Maw Maw just passed away. I’m feeling such a mix of emotions right now. Sadness because I won’t get to sit across the table and chit chat with her for hours when I’m in New Mexico and laugh with her anymore. I won’t get to hear her tell me how much she adores my husband and how she knew I had made a mistake when I broke up with him during our dating years. I won’t get to hear her tell me what a “dandy” sweet Arle is. And I’m sad she won’t get to meet the sweet little peanut growing inside me. I’m also feeling a sense of relief. I’m so thankful that she didn’t have to suffer any longer than she did. I’m thankful that she died peacefully in her sleep. I’m thankful that she had loved ones at her bedside when it happened. I’m especially thankful that she knew Jesus and that she’s with him now. She was a remarkable lady. I’m so grateful for the incredible role model she was for me and that she showed me what it means to truly be a selfless person. She always always always put others before herself. She also taught me the importance of using proper grammar, blowing your nose instead of walking around sniffing all the time, and to love wearing bright colors. I love you, Maw Maw, and can’t wait to see you again someday. What a lady she was! Walked with such class and grace! Will be praying and loving on you all! So sorry friend. Praying for you guys. So sorry for your loss!! She was a special lady! I really enjoyed seeing her a few times in the last six months or so in Collage when she came to get her hair done. She was a pretty lady who always looked and acted her best! Love you Heather! Oh, Heather I’m so sad to hear about your loss. What a blessing to have had her in your life, and what an encouragement to know you will be with her again! I’m so glad that she knew you have a sweet baby on the way. Lots to look forward to after this life! You and your family are in our thoughts and prayers Heather. i’m so sorry to hear this, heather. we are praying for you and your family. please let us know if there’s anything we can do. lots of love!! 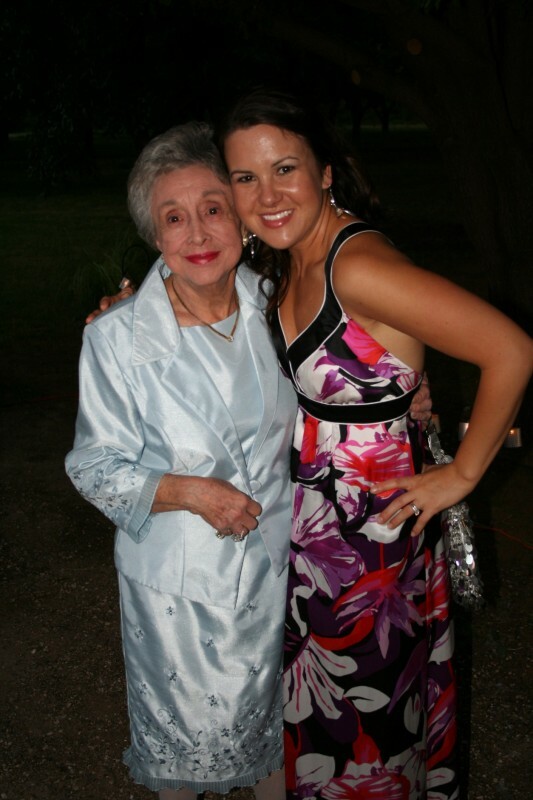 Sweet Maw Maw…what a treasure she was. How blessed I am to have had her as part of my life, too! It is truly a blessing to know she is with the Lord right now. Love you so much. Am praying for your whole family. Love, prayers and hugs from the Ridenours. so sorry sweet friend… how special that you had a great relationship with her! As long as I live, I’ll never forget Marj’s solution to our sniffing…..
she always had a hanky to offer. What a lady….how precious…. sweet Jesus, for relieving Maw Maw of the earthly garment that was no longer needed to house Your spirit. Thank You for setting her free. Heather, I am so sorry to hear about your Grandma…sounds like a sweet and precious lady! So thankful we know she is with Jesus now and you will see her again!!! Some of my earliest, dearest, most important memories in life are of my family’s time together with John and Marjorie and Lee and Scot; Nanci and Melissa. What great joy. The memories just keep flooding in. Our tears are tears of joy, and gratitude for all that Marj brought to this life; and, lots and lots of laughter in remembering. How we have loved John and Marj and Lee and Scot, Nanci and Melissa, and how each of their lives have have unfolded and flourished, nourished others. What a beautiful legacy Marjorie leaves here for the time being, and don’t you know there is a whole lotta dancin’ goin’ on in Heaven right about now? Sarah Purcell Tindall, Jim and Khaki, too. what a precious lady with a lasting impact.